Poetry can push at boundaries and cross them, going where other forms of communication falter and fail, helping us when we need to face difficult and even taboo subjects. For this reason poetry is often called upon when we find ourselves at unavoidable frontiers and need to confront them, notably when we face death and bereavement. 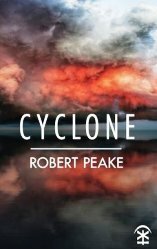 In Cyclone, Robert Peake writes about the deepest grief of all, the loss of a child, in poems that stun with stylistic ability while reaching out and touching the reader emotionally. The collection opens by introducing an irresistible character who gives his name to this and other poems throughout the book: “The Man with the Kindest Face”. I confess I liked this idea so much that I wished I had come up with it myself and I started by reading all seven poems featuring him. The kindness of strangers in times of suffering is a common trope, but Peake’s approach is different as he shows the random small and considerate acts of passers-by and defines them as deeply compassionate. At times of vulnerability these less than extraordinary kindnesses and polite gestures can feel like demonstrations of human warmth, making these poems both suggestive and perceptive – Peake is skilful at conveying state of mind. The poems featuring this persona reflect the main themes of the collection: not only loss and grief, but also alienation caused by exile, the anonymity of travel, and the need and ability to connect with others. Two of the four sequences of poems follow a formal pattern, with “Cyclone” composed of tercets and quatrains. The striking opening poem “Waterspout” is followed by different approaches to the theme, all using water in its various states as imagery. In “Steam devil” the poet takes his nephew to the zoo and sees the child ‘alight with the joy of being startled, and safe’ while the opening line ‘I see you in the exhalations of a steam train’ reminds the reader of the lost child evoked in the taste of wind spray in the previous poem. These poems are strong on their own but are also interwoven with repeated themes, imagery and narrative. Perfect girl in a field of poppies. Popping perfection pills. and the dark tilling begins in the green-sparked air. far too long we dreamt of falling and never awoke. The opening line hits home when it is repeated to conclude the poem after these lines in reverse, which is the beauty of the specular form. For me “Mesocyclone” would have worked better in just two seven-line stanzas, with a break between the repeat lines in the middle, rather than adhering to the quatrain form of the sequence. Quatrains place the turn and the two identical central lines at the end of the same short stanza, rather than giving the first mirrored line a more powerful position at the start of a new stanza. Peake varies the formal patterns used for the four sequences and has some poems within these sequences that defy formal restrictions. The opening “Nomansland Common” series has poems with no stanza breaks, a style I enjoy, while “Mood Diary” includes more experimental styles such as fragmented lines. Although I favour the lack of stanza breaks, there’s a certain enjoyment to be had from diversifying within a collection. In “The Opposite of Sleepwalking”, the seven poems have fourteen lines each and no stanza breaks. These are not sonnets, unless they could be loosely described as modern sonnets, as they have short lines and no rhyme or metre. This length of poem works well visually, with two per page, and also thematically as fourteen lines are arguably the ideal poetic unit for developing and expressing a single subject concisely. crying for her lost calf in a field of hay. when the fire goes out? of the one I loved. And so I walk through the night. And night walks with me. Othello, Union Theatre. Review by Barbara Lewis. Nellie Cressall on the Isle of Dogs Part 1, by Jane McChrystal.